Just spotted this gem over on Can You Dig It! A little while back, Jaunt‘s Mike Potoczny and Deluxe‘s Mark Potoczny took a trip from Pittsburgh on down to New Zealand to see just what the place had to offer! Check out this video giving us a look at some of the parks and spots they had the chance to ride like Gorge Road, along with a bunch of other things like hiking and cliff diving! This is one rad BMX video! 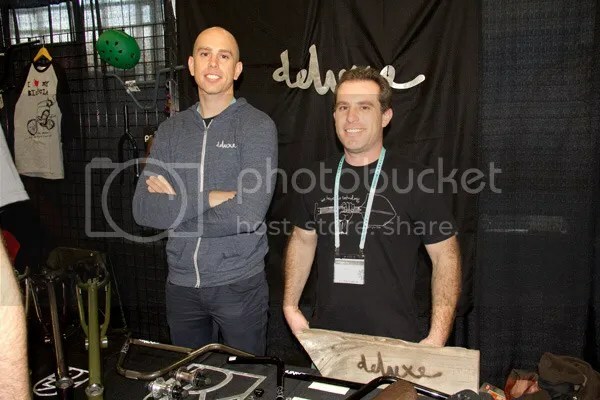 It was announced back in September that Deluxe had three new owners that would be taking the reigns after Mark Noble had stepped down from the brand to pursue some new opportunities! We were definitely interested to see what the new guys in charge had up their sleeve and we finally got our first look at just what the had in mind this weekend at Frostbike! Check out a handful of new and slightly re-designed products that will be hitting shops and mail-orders soon after the jump! “After 4 years of riding for Subrosa, I’ve decided to part ways. The move is on all good terms and I appreciate to the fullest all that Subrosa has done for me. It’s been an awesome ride and I want to say thank you so much to everyone involved for making me part of the family! I will, most definitely, miss the trips with the awesome group of dudes that make up the team. Always a good time with that crew! In moving forward, I will be joining the Deluxe Bmx pro team. Here’s one we just spotted over on Can You Dig It! James Van De Kamp has been apart of the Deluxe squad for a little while now, but today we finally have his official welcome edit that’s packed full of style from cement parks, a dialed backyard ramp setup and the Burlington Bike Park out in Oregon! Get a look at this! Just spotted this gem over on Can You Dig It! Check out Kurt Perkins turning up the style on some trails and cement parks out in Utah for Deluxe! So good! Here’s one that is bound to get a few of you older guys psyched! Mike Szczesny is now doing it for Deluxe! We haven’t seen much of Mike since the early 2000’s but it looks like he’s still crushing it as always with plenty of style! Hit play and enjoy this welcome video loaded with trails, parks and street clips.